After an interaction with your company, the Customer Effort Score (CES) is designed help you understand how a service interaction went by asking your customer if your company made it easy to solve their problem. But why is this important? The reason is that measure customer effort is the driver with the strongest tie to customer loyalty. Or stated in another way, the less effort a customer has to put forth to solve their problem, the more likely you are to see that customer again. In 2010, the Harvard Business Review’s (HBR) article “Stop Trying to Delight Your Customers” made the case that trying to delight customers in the support channel doesn’t have a huge impact on creating loyalty, but reducing effort to solve problems does. In fact HBR’s research showed that a good Customer Effort Score (CES) was a better predictor of repurchasing and increased spending than the Customer Satisfaction Score (CSAT) or the Net Promoter Score (NPS). Customer experiences are important and the best way to engender customer loyalty is to solve their problem easily and quickly. That makes the Customer Effort Score (CES) a great barometer for how well you are supporting department is doing at helping your business maintain and further business growth. Here are some tangible benefits that have come from a good Customer Effort Score. Costs decline because making low-effort experiences generally involves less escalations and channel switching. Here’s a quote from HBR’s article. What does the Customer Effort Score (CES) score look like? 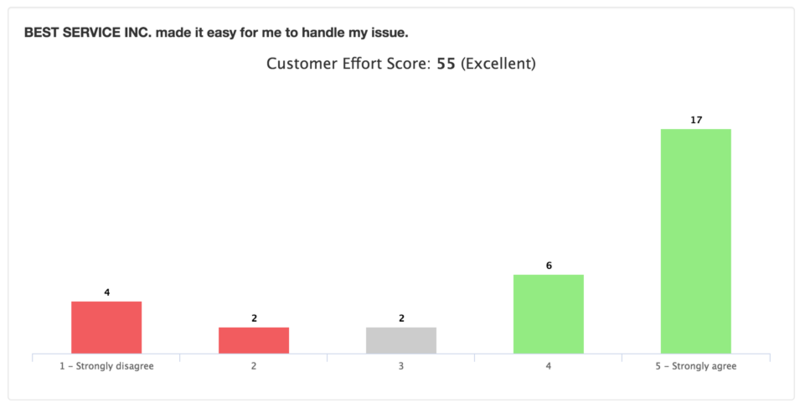 The Customer Effort Score question simply asks “[CompanyX] made it easy to handle my issue” and gives a rating scale of 1-5 as to whether they agree or disagree by with that statement. The Customer Effort Score can help collect insights at interaction points along the customer journey, especially after an interaction were a customer is trying get something done. Here are some examples of different interaction after which you could ask a CES question. In addition to registering each response, an overall score is calculated given all responses. Here’s how the overall score is calculated. The total number of respondents that who at least rated you a 4 or 5 are divided by the number of respondents surveyed. Its that simple. So, if 100 people responded and 89 gave them a score of 4 or 5 then your CES score would be 89. Knowing your customer what kind of experience customer had is one thing but by adding one additional question, “How can we improve?”. This will give you actionable advice that you can use to improve you support department. 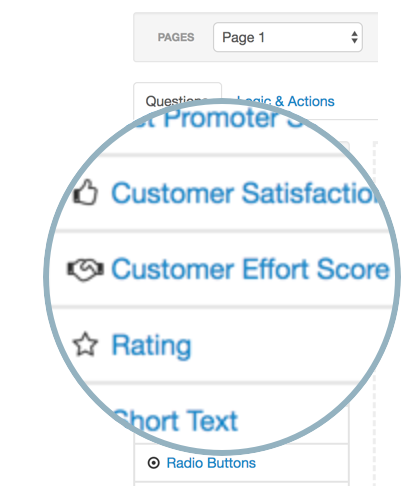 Use CES score changes over time so you can keep a tab on how your business is performing. Additionally you can pass in additional data when a customer takes the survey so that you can further slice-and-dice results given other criteria you know about your customer, such as product purchased or the store they purchased from. Additionally, you can also setup SurveyTown surveys to alert company personnel to negative reviews via email so they can pro-actively solve customer problems. 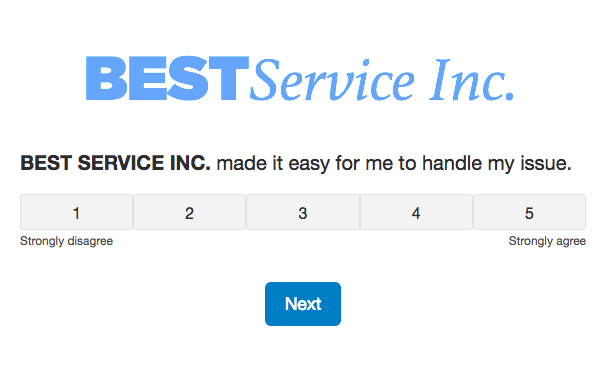 Customize your CES survey to show different result pages based on their customers CES ratings. Quickly create a Customer Effort Score (CES) survey by dragging and dropping a Customer Effort Score question into a new survey. Once created, we provide for you a URL that you can post on your website. If you want to embed the CES question in an email, we also provide you some HTML that you can embed in an email. Once your customers answer the survey question, we will added into a report you can see in our interface. You results can also be received via our Webhooks or retrieved via our API. If you have questions about our plans or need some guidance on the type of plan that is right for your organization, please contact us. Were happy to help!